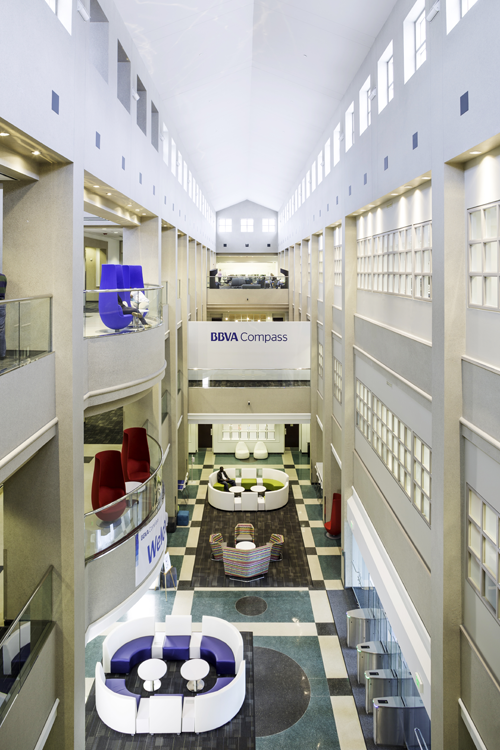 BBVA Compass has recently made several large investments in its banking hub of Birmingham. In 2012, the city was host to a $360 million core technology platform. This year, Innovation Depot will house the bank’s cross-industry technology center. BBVA also has invested in the future of the industry with a new technology hub in the Brock Operations Center in downtown Birmingham. BBVA Compass opened its new technology development center in April, showing off the $13.5 million renovation that’s intended to facilitate collaboration and easy communication, complete with an open floor plan and communal spaces. Apple co-founder Steve Wozniak and Birmingham Mayor William Bell attended the opening ceremony. Managers share the floor with the staff in favor of interaction and accessibility. Teams are grouped by project and seated at amorphous desk clusters. As the groups interact and work crosses over, employees move across the floor, the entire exchange resembling cells under a microscope. Common seating areas feature circular couches and flat screen TVs. Each monitor is enabled to sync with the staff’s digital devices, allowing information to be shared in a comfortable setting. A central atrium keeps the entire office airy. Meetings may be held on the colorful couches or over a game of foosball. More traditional meeting rooms surround the open office, with glass walls offering some separation while maintaining transparency. Even the space’s sound was taken into consideration in the renovation. White noise is piped in to fill any silence. The entire space hums with layer of soft sound. The hum is almost unnoticeable, but offers just enough audible cover to have a conversation at a desk without involving the surrounding office. Private calls can be held in the quiet booths scattered throughout the office or in the sound-absorbing seats overlooking the Brock Center’s atrium. Glass partitions provide some form to the space without obstructing the view or blocking light from the windows. While the large windows provide natural light and expansive views of downtown Birmingham, some sections benefit from festive string bulbs and color-changing rope lights rising from the center of each desk cluster. The staff makes frequent use of the abundant portable whiteboards throughout the office. They have become popular tools for brainstorming, note taking and personalizing the workspace with dry-erase art. Here and there, walls are adorned with the company values and new tagline: “Banking on a brighter future.” Announced in May, the new slogan aims to reinforce the bank’s emphasis on customer support. It’s especially apt here in the Development Center, which focuses on making online banking easier for customers. BBVA Compass has about 3, 000 employees in Birmingham. The Development Center employs nearly 500 team members between the IT-focused Technology and Support Services unit and the Digital Bank, which handles commercial offerings, the bank’s multi-channel strategy, its distribution model and its commercial and operational designs and processes. In addition to these projects, the Development Center manages BBVA Compass’ technology infrastructure, operations and information security units. Work spaces are all designed to allow individual endeavors and collaboration. Since opening the technology hub this spring, the staff has already made strides in the bank’s digital banking endeavors. “The team was instrumental in the recent launch of a new BBVA Compass mobile banking app, helping advance what was already an award-winning tool for our clients, ” says Dennes. “The app’s added capabilities, easier navigation and streamlined look and feel were designed to improve overall client experience.” The Development Center staff also assisted in usability testing and behavioral analysis during the app’s development. 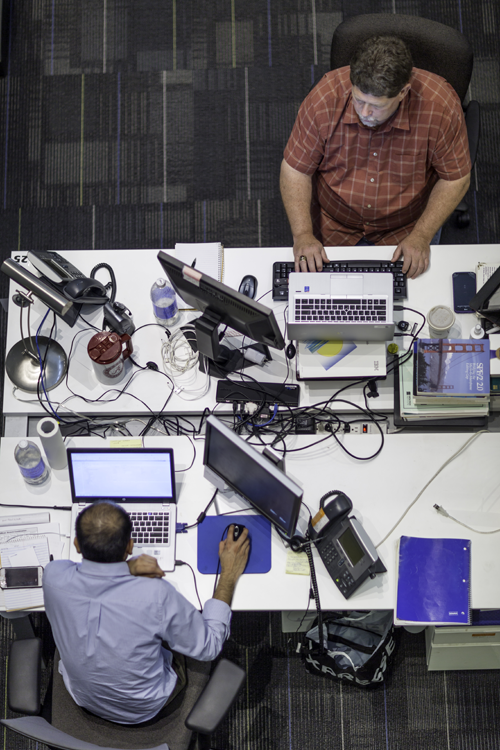 The Development Center’s projects are divided among “agile teams” of five to seven members. The tech hub, says Dennes, is now pioneering one of the first real-time processing systems in the U.S. banking industry, poised to revolutionize the transaction process. “Most of the financial services industry continues to rely on batch processing, meaning they bundle customer transactions that occur throughout the day, reconciling those transactions and updating customer information overnight. Real-time processing refers to the bank’s ability to process transactions on behalf of our clients immediately, giving customers an up-to-the-minute view of their accounts for greater financial control, ” says Dennes. The bank has partnered with the all-digital payment network Dwolla to enable the instant sending and receiving of funds. “The collaboration eliminates the wait associated with the decades-old Automated Clearing House, where transfers typically take two to five business days to clear, ” says Dennes. Dennes and the company see broad potential for the new technology in a variety of fields. “Real-time transfers with BBVA Compass is particularly useful for startups, enterprise companies and small businesses looking for a simple, secure and inexpensive way to collect funds, make disbursements or handle B2B payments, ” he says. Thomas M. Little and Art Meripol are freelance contributors to Business Alabama. Both are based in Birmingham.